Monique Lhuillier’s career in designing lavish bridal collections started when she was shopping for her own wedding dress 17 years ago. “I graduated from fashion and was looking for a wedding dress, and I couldn’t find a lot of options. I ultimately bought a dress, but I didn’t think there was enough choice out there. I knew I could bring something exciting to the bridal industry,” the designer explained to Savoir Flair during her recent visit to Dubai. In the interview below, Lhuillier opens up about her creative inspirations, what her wedding dress would look like if she were to design it today, the dos and don’ts of choosing your dream gown, and how her trip to Dubai has been a source of inspiration. How long are you in Dubai for? I’m here for three days. Are you doing any sightseeing while in town? We visited a lot of places yesterday. We went to the Burj Al Arab and the Burj Khalifa. We also went to the souk, and we had a lovely dinner at the One & Only. It’s gorgeous there. My main inspiration is strong women, strong confident women who make a difference in this world. Have you had the opportunity to visit any of the malls? We haven’t, but we did get to stand in front of the Burj Khalifa and watch the water display. It was so nice. We saw the mall from the outside, but we didn’t go in. I’ll be there tomorrow. 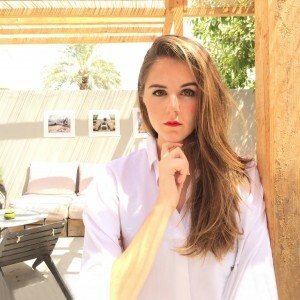 Any observations about women’s style here in Dubai? Has anything in particular stood out to you? I think the women in Dubai are very fashion forward and very fashion aware. I mean, they live such a global lifestyle, they travel a lot, and they keep up with the latest things in fashion. They have a real appreciation for beautiful things. I’ve been doing business now with stores in the region for quite some time and, in my experience, Middle Eastern women gravitate towards the details, the glamour, the beauty, and the femininity of my collections. Do you design a collection with a particular woman in mind? My main inspiration is strong women, strong confident women who make a difference in this world. Every time I approach a new collection, I have a girl in mind. It is not one particular woman; it’s just women in general. I always say that it’s an advantage being a woman designing for women. I feel like I know how women want to feel in clothes, what they want to highlight, and what they want to cover up a little bit. So it’s been that balance that I’ve been able to achieve through the years. Your ready-to-wear collection was a bit darker in mood this season. Can you talk us through the inspiration? It depends what season it is, because they have different feelings and different moods. We just showed in New York in the Lincoln Centre, and the collection definitely had a dark romantic side. I felt like it was time to kind of have all these slinkier silhouettes and I wanted it to feel more mysterious for the season. So I changed that a little bit, and I added a little bit more edge to my collection than normal. Whenever I do my collections, I just go with my gut. Well, every season it can start from either a trip that I took or a piece of beautiful contemporary art. I love architecture too. Sometimes it starts with seeing beautiful fabrics, then there is an idea that just starts in my head and I think of a concept for my collection. It isn’t so much about sketching for me; it is about draping on the form. I like working with three-dimensional material. It’s like working with my hands, and then the collection comes together. I am not one of those designers that sketch the whole collection first; I need to see fabrics moving on the models’ bodies. I need to touch everything. I can say that I start with the shape. I get the inspiration, and then I move on to shape, then the fabrics come into play. You talk a lot about travel and inspiration. What’s your favorite place to travel to? You are originally from Philippines, correct? I was born and raised in Philippines, and then I was sent to a boarding school abroad. I lived in Switzerland for two years before moving to Los Angeles. I stayed because my husband is from Los Angeles and we have created a wonderful life there. But we are always in New York, because to be in the fashion business you need to be in New York once a month. I also travel because I love it and it inspires me so much. So, I have many favorite places; I don’t just have one. I love going to Paris, and I love going to Italy. Coming to the Middle East was always on my list of places to visit, but with my schedule it took a little longer. I love going to Asia, to the Philippines, Japan, and Hong Kong. I read that you originally started your bridal collection because you went looking for your own wedding dress and you saw that there was this niche in the market as you weren’t able to find the beautiful wedding gown you envisioned. I started the business with my husband 17 years ago. I graduated from fashion and I was looking for a wedding dress, but couldn’t find a lot of options. I ultimately bought a dress, but I didn’t think there was enough selection out there. I knew I could bring something exciting to the bridal industry. So, after I got married, I started in bridal and I did that for the first seven years. I only worked in white and ivories. Then I thought, “Why not continue this journey with my client? Why does it end after her wedding?” There are so many other wonderful things she is going to celebrate throughout her life, so I started with eveningwear and immediately a lot of celebrities picked up on it and started wearing the pieces. It was recognition of my brand. But why stop at evening? The brand has evolved with the many needs of my customers. If you were to design your own wedding dress today, what would it look like? It would look very different. I have been married for 19 years, and if I were to design one for my 20-year anniversary, which is next year, it would definitely be in lace and it would be something closer to the body, ethereal, and probably with sleeves. And my hair would be down. I was 22 years old and a different person then than I am now. What are your dos and don’ts for choosing a wedding dress? I approach bridal design differently than I do my ready-to-wear collections. Bridal is about fantasy and romance, and I let my mind just run free. I don’t design a collection as a collection; I design it as a dress, because each one is for a different girl with different emotions on her wedding day and different dreams of what her wedding should be. This is how I approach it. I always say to my brides, “Don’t follow trends; you should really go and shop with an open mind.” I would recommend trying on a lot of different silhouettes. You’ll be surprised by how beautiful you look in a silhouette that you never thought you’d wear. Think that this is the most iconic piece of clothing you’re ever going to buy, so take your time. When you’ve found the right dress, you’ll just know. Any additional advice for your brides? The other thing I like to tell my brides is not to carry a bouquet that is too large and oversized. Brides make a mistake of carrying such a big floral arrangement that you don’t see their waist or silhouette and all you see is shoulders and a flower garden. You need to think through the entire look. You’ve had so many celebrity bridal clients. What’s that like? I just did Stacey Kiebler’s dress; she just got married last week. She had called me two days before the Oscars and said, “Do you have a special white dress that I am going to need for this special event?” I told her, “This is not just an event. You are getting married!” It was very secretive, and we did it in four and half days. It was a very intimate wedding, she was going to be barefoot with only eight family members present, and they didn’t know they were going to a wedding. Have you seen anything in Dubai that you’ve felt particularly inspired by? I’ve seen a lot of beautiful, intricate architectural details, so the pattern resonates with me. I also love all the embroidery that I’ve seen. Walking through Dubai, I’ve really taken in the culture. We also went to Kuwait and Qatar. The jewelry is so beautiful, and there is such a rich culture here in the Middle East. I’ve really enjoyed being here and meeting customers. Talking to them, it was so nice to see that what they are looking for here is the same thing my customers are looking for back in the States and in Europe.